What are the benefits of linking my Facebook account? Makes it easy to find your Facebook friends on Kongregate. 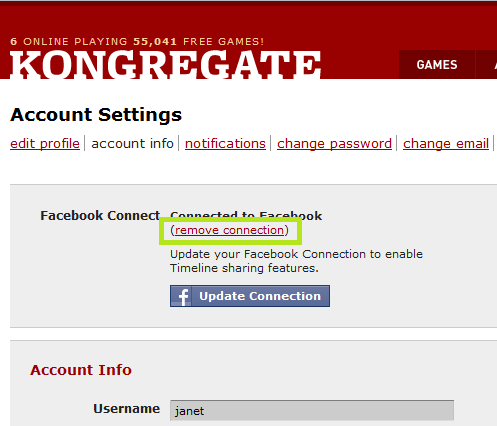 If you’re new to Kongregate, signing up via Facebook means you skip our registration form. One-click login to both accounts—easy just got easier. Bonus round: Get 25 points for linking your accounts. I don’t have a Kongregate account yet. See the blue "Facebook sign in" button on the top right-hand corner of your screen? Click once and follow the instructions. Go to your account settings page. Make sure all of the sharing boxes are unchecked, then click remove connection. Done! Remember: If you originally made your account by connecting via Facebook, you’ll need to set a Kongregate password or you’ll be locked out of your Kongregate account. Why are you asking for information from me? When you link your accounts, you’ll be asked to allow some information-sharing, as with any Facebook app. This includes your basic info, stuff we ask for when you sign up for a Kongregate account anyway. We also ask for the ability to send you e-mail. Never fear! While we never want to send you stuff you don’t want, we do want the ability to offer you cool new features as they’re developed. Kongregate users won’t be able to see your real name or any of your other Facebook information, unless you’re Facebook friends already. A possible exception: if you create a brand new Kongregate account using Facebook connect, your proposed Kongregate username will be based on your first name and last initial on Facebook. It’s only a suggestion, though, and you can easily choose something else when signing up.